Okay, that’s a lie. It was actually two shades of purple. But I kind of loved it anyway. I was really fighting with the altar this week. I was running out of time, it was getting late on Saturday night, I had a million other things on my mind and I was super frustrated. I actually had something completely different set up, but then Jon’s voice popped into my head: “Less is more.” I ripped everything down and started over. I ended up just keeping it simple. Deep shades of purple fabric cascading down with the palms on top. I actually usually put a candle in that jar with the palms in it, but it looked neat with the palms. I turned a wooden basin upside down underneath the fabric so the palms wouldn’t be on the ground. 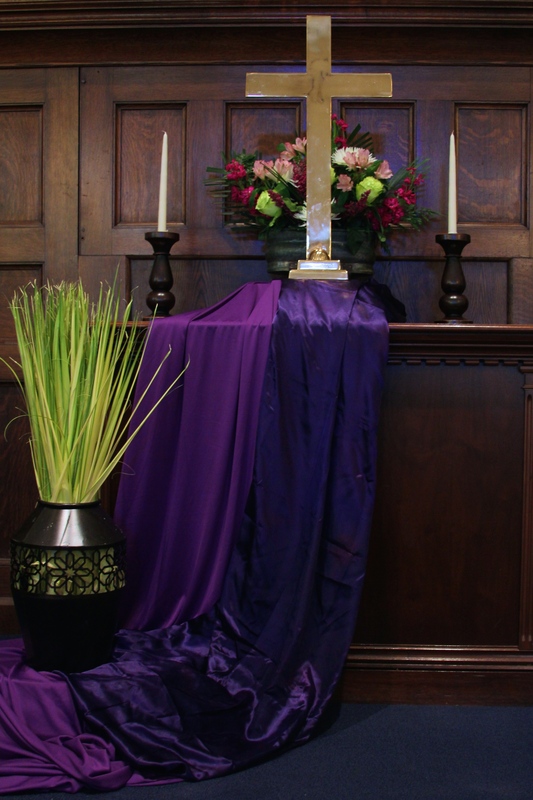 One of the biggest problems with having the altar on top of the platform the way ours is set is that if you put something on top of the altar, most people can’t see it. So when you are creating your visuals, you really need to either build up off the altar or down the front. Last year I had a beautiful pathway to the cross, but looking back I’m not sure anyone except me and whoever the worship leader was could really appreciate it. I was in the sanctuary this afternoon starting to set up for Thursday and am trying to use the same “less is more” philosophy. Our space isn’t that big, so a little really does go a long way. 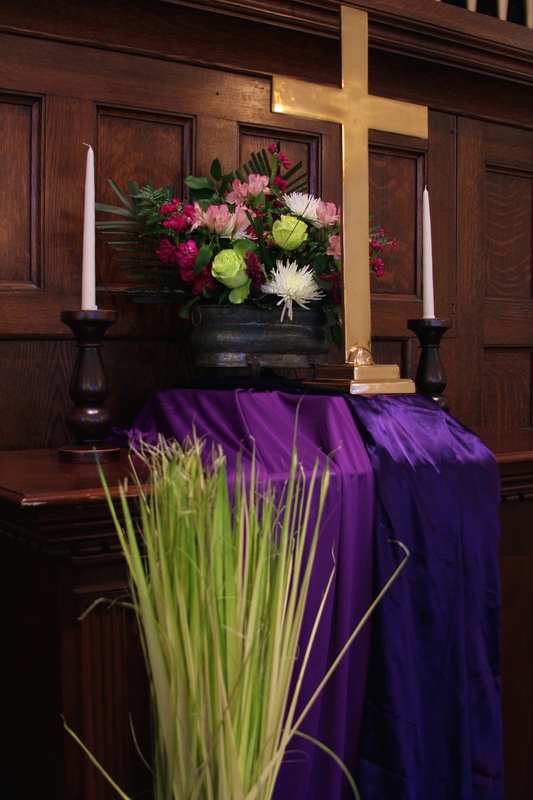 Blessings to all of you as continue your journey through Holy Week! May it be filled of reminders of the resurrection – in ways both big and small! Love your altarscapes. As usual, this one is stunning!